Editor’s Note: This is part 1 of a three-part series about the Sagebrush Drive widening project. 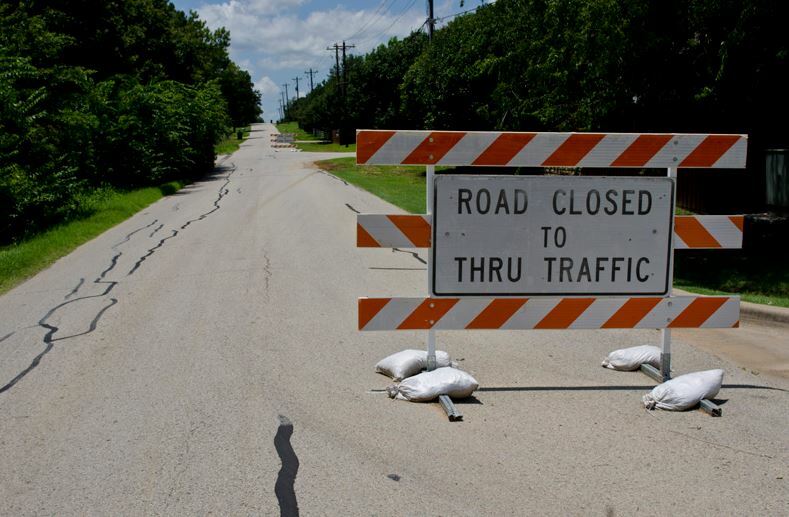 Work is already in progress widening the west end of Sagebrush Drive in an effort to make it safer, but some who live on the short strip of road want Flower Mound officials to rethink the plan, worried that the finished product may have a frustrating impact on their lives. 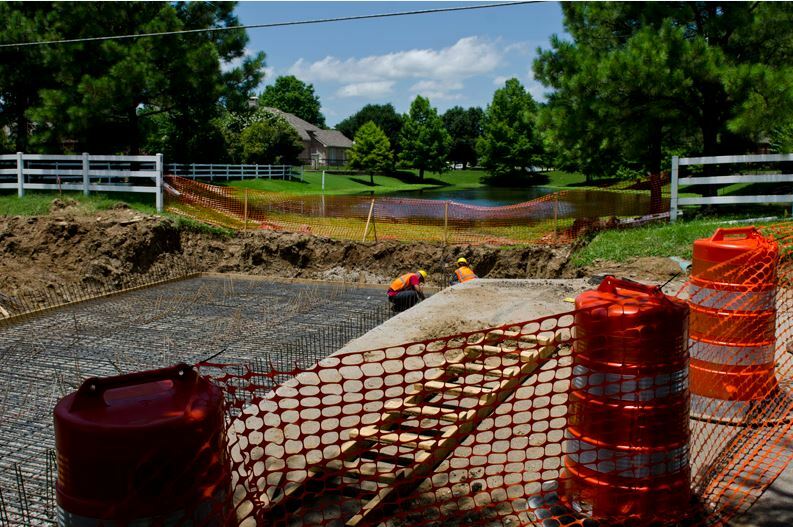 Included in the town’s plans is a drivable stamped color concrete median that is flush with the concrete paving adjacent to residential properties. The hope was that such a device would help stem speeding, which has become an issue. 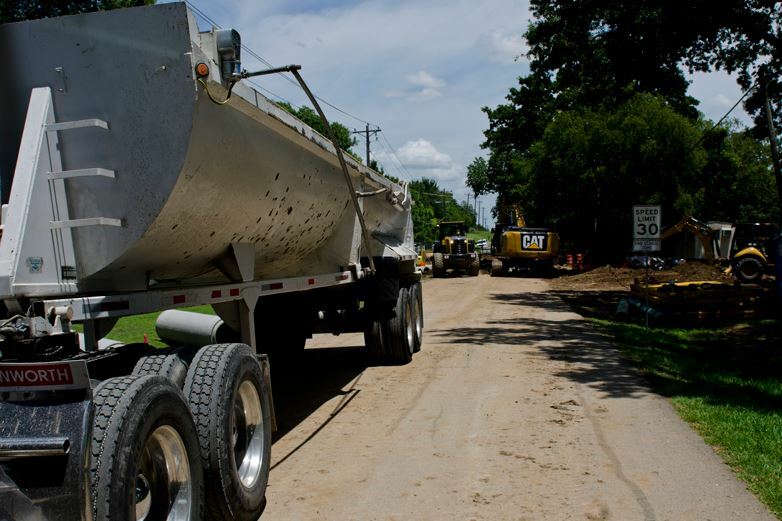 “Speeding was one of the major concern of the adjacent residents even prior to the beginning of public hearings for the project,” said Ken Parr, public works director, in a letter to residents. Two other options for Sagebrush were presented to residents during a series of charettes over the past two years. But that doesn’t mean everyone concerned is on board with the work. This part of Sagebrush ends at Old Settler’s Road, at Flower Mound High School. Because of its high traffic volume, Sagebrush is designated as an urban collector street in the town’s throroughfare plan, Parr said. “Sagebrush residents are aware that some students speed down Sagebrush,” Thompson said. “The police need to put a stop to that. A few weeks of speeding tickets and insurance rates for teen drivers being impacted and the speeding will stop. A meeting was held within the past week with residents who live on and around Sagebrush. Itamar Gelbman (Place 5) and Brian Rountree (Place 1), two of the council’s newly minted councilmen, attended the meeting. Resident Tamiko Ryan said the project was approved and the town should move forward and not risk being held financially liable for backing out of the project. On June 1, the town council voted unanimously to award a $2.4 million to CD Builders. At that time, no council members objected to the details of the project. “I am concerned that we continue to debate issues that have already been decided,” Ryan said.”This council voted on June 1st to continue with the project. Several members meet with residents that live on Sagebrush and now we have the same issues being presented that have already been debated. We have debated these problems for over a year and spent 1 million dollars on the project design. 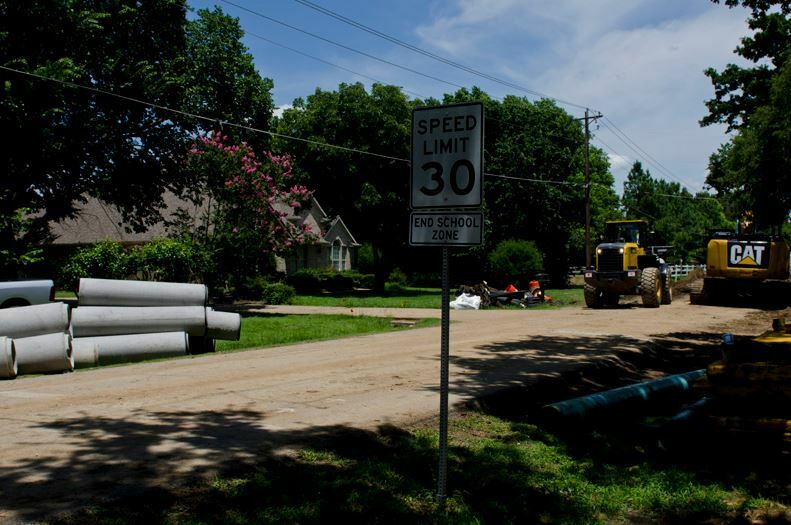 Neighborhood meetings were over the past two years to review the plans as they were completed 30 percent, 60 percent and 90 percent of the way. As of press time, Gelbman and Rountree did not return requests for comment. Find out tomorrow in part 2 if nixing the project now that work has been started could have a financial impact on the city. A Million Dollars to design a median for a half mile rd? What the Hell….that’s what needs to be investigated! Sorry, but I would think that due diligence has been done and planes were finalized through the proper process. DO NOT spend more of my tax money accommodating internet civil engineers. 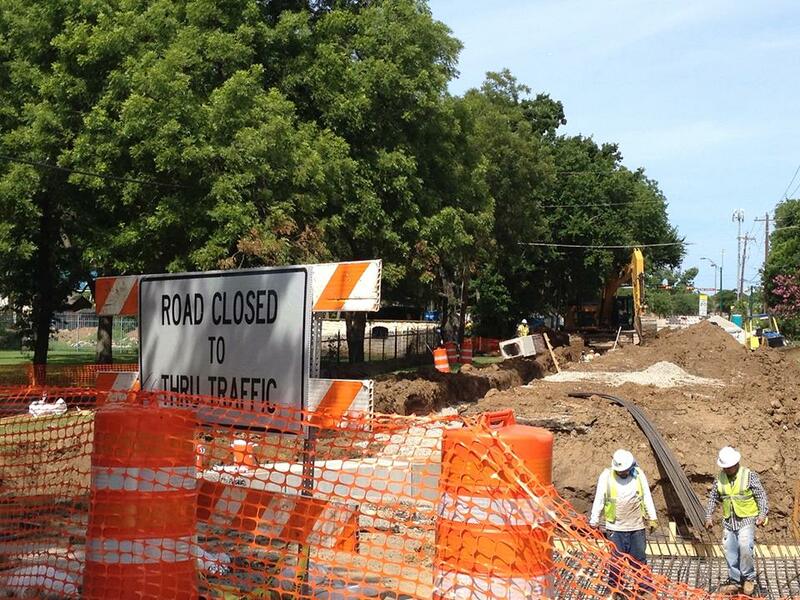 Unless residents want to pay for the changes the town should continue to finish the project. Hasn’t this already been decided? Tami Ryan is completely correct. What is amazing to me is this oddball alliance between Itamar and a small group of about a dozen far left liberal women who post on FMC. Rountree and Itamar are trying so hard to please this group that they are ignoring what is best for the tens of thousands of other residents of Flower Mound. But unfortunately, this small cadre of obnoxious liberal women wants the Sagebrush construction to be completely changed midstream, just like they wanted Nels removed from P&Z for no other reason than to be petty, vengeful and vindictive. And they will probably get what they want. I’m hoping Kevin Bryant at least considers looking at this issue objectively with the best interests of the entire town in mind. We’ll see. Right now we all know who’s pulling Itamar’s strings, and it’s a bunch of crazy liberal women who will complain about anything and everything. Unless YOU LIVE on that street, we should keep our opinions about ANYONE regarding the issue to ourselves. There is a lot more to this debate than what is being revealed on this “news” item.. believe me. These “far left Liberal women” ARE looking out for the best of their street and adjoining neighborhood. Which is also MY neighborhood. I’m not going to go into a large debate with anyone about the issue. I am, however, in full support of what they are trying to accomplish and if everyone knew ALL the facts and details, you would be also..